When neighbours Ruby and Jackson first met, they had little in common. But once they had discovered Thing, the squirrel/troll/fairy inhabiting the trees between their adjoining gardens, they became inseparable friends. Thing performs disruptive and anarchic magic – in this third novel in the series, he becomes fascinated by water and the concept of swimming, a pastime which he has not yet encountered in his limited life. Thing is often provoked into using his magic when he is anxious. On the first occasion, it happens when he decides to explore the bathroom and packs the room with bubbles from Ruby’s bath. 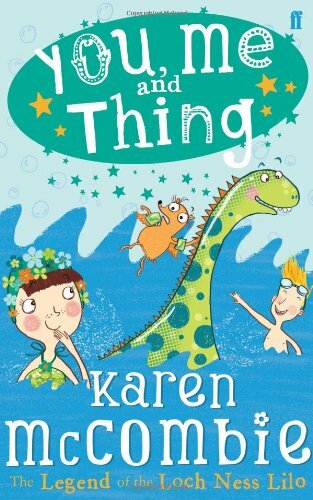 On the second occasion, the chaos caused by Thing’s attendance at a pool party is predictable – the means of causing the chaos is nevertheless hilarious as he turns a harmless lilo into a Loch Ness Monster. After that, the pool party goes with a crackle, a fizz and spit just like Thing’s magic. The book uses font, layout and images to great effect to create a funny, white-knuckle read for 7 – 9 year olds which lurches from drama to crisis as chapter follows chapter. It is every bit as funny as its two companion novels and thoroughly recommended for anyone who enjoys a little chaos and a lot of laughter.